In this painting by Rawat Vongla, the gentle features of Buddha's face glow with golden hues. 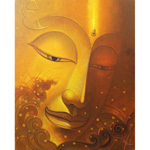 The artist names this beautiful work 'Light of Dharma'. The Dharma is the teachings and the methods of the Buddha. 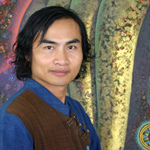 Artist Rawat signs and writes his name in Thai at the bottom of the painting.